It may seem like a giant leap from working as a 911 operator/police dispatcher for the LAPD to designer of a new collection of needlework designs (soon to be published by the Caron Collection), but Pam Davenport is proof of the hidden talent in many of us. The lack of formal training hasn't hampered her creativity; it may in fact, account for her fresh and very unique style. Pam usually starts her work by graphing out a picture. 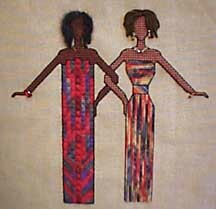 Later she backstitches the design onto an open weave fabric so that she can refine the figure as she stitches it. By not following conventional rules, but trusting instead to her own instincts, Pam is able to individualize her designs very effectively. 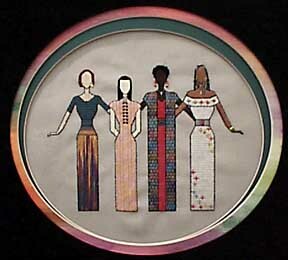 Pam first became aware of the Caron Collection threads at a Needlework Show. She was so intrigued by the work displayed at the Caron Collection's booth , that she picked up some skeins , uncertain whether they would lend themselves to her designs. Buoyed by Lois Caron's encouragement and enthusiasm for her patterns, Pam began experimenting with the new colors and textures, incorporating them into her work with stunning results. In addition to the "SisterFriends" designs, Pam has completed a biographical series of portraits, including Dr. Martin Luther King and Malcolm X among others. She is currently involved with some works featuring geometric designs (see the patterns above), adapting the Caron threads in new ways. She often will customize her work even further by embellishing the frame, creating a unique matting effect or adding some other unique touch to the way it is displayed. While Pam had initially undertaken this endeavor with only herself and her friends in mind, an incident occurred which propelled her to get her designs published. A co-worker, who was being transferred, requested that Pam stitch a picture for her, incorporating the friends she had made at the LAPD. Within hours this list had multiplied. Months later Pam was surprised to learn of the prominent place it occupied in her friend's home, serving as a daily source of inspiration and motivation. Just one example of the powerful effect of her SisterFriends designs. Below the piece Pam created for her friend who was leaving the LAPD. 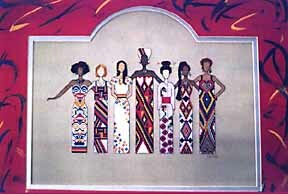 "The popularity and inspiring quality of Pam's designs rests in the fact that each of her figures individually portray an enviable strength and poise but collectively, with arms linked, the figures convey unity, cooperation and bonding, sentiments women of all races can and do identify with." Pam Davenport's "SisterFriends" collection will be published and distributed by The Caron Collection and should be available in retail shops by the end of the 1997 year. Watch for an announcement at this site. Note the unusual mat treatments Pam finishes her pieces with. They further enhance the decorative quality of her designs and compliment the patterns.